This picture was posted on the Facebook page, The Other 98%. Is this really true? Will the premium be more than half of the income of a 64 year old under the proposed new system? And is the old rate true? This figure has been extracted from the Congressional Budget Office (CBO) report. 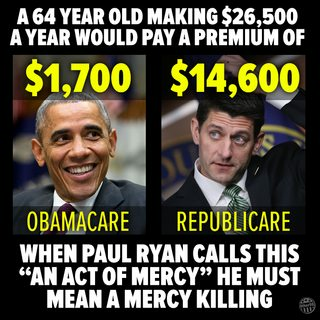 According to the CBO, 64-year olds making $26,500 per year would see their premiums increase by an estimated 750 percent by 2026. While they are on track to pay $1,700 under the current law, the CBO projects the American Health Care Act would force them to pay $14,600. Even if you grant that inflation will allow them to make slightly more money by 2026, that's still about half of their income going to health care. Like all economic modelling, the CBO report is based on assumptions that you might disagree with, but the original claim is not invented - it is backed by a reasonable source. 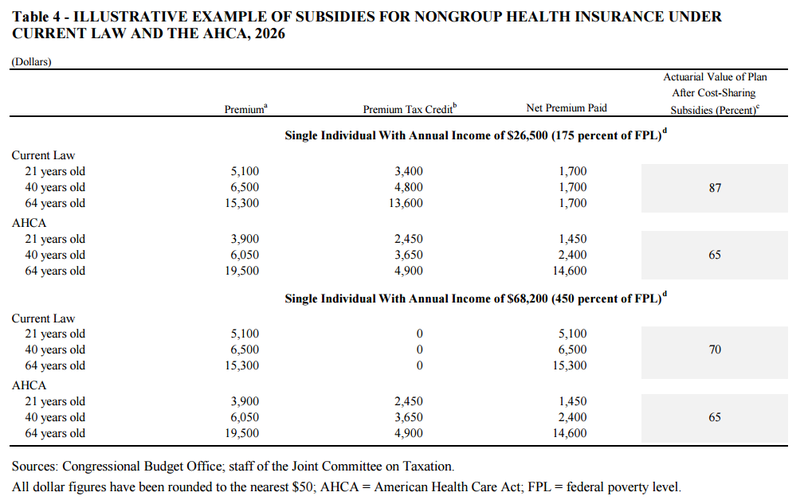 The chart as a whole is for non-group health insurance plans offered to individuals. At the time of the 2016 census (PDF), 56% of the US population was covered by employee-based group plans, while only 16% were covered by the kind of non-group direct-purchased plan discussed here (but that is still over 52 million Americans). Premiums increase with the age of the covered individual, but since someone 65 or older may be eligible for Medicare, age 64 represents the age with maximum premiums. The "premium tax credit" is calculated based on income, so individuals earning significantly less than $26,500 a year would be eligible for higher credits, or might qualify for Medicaid (depending on state participation). Is Tagg Romney the owner of a company that makes Ohio voting machines?